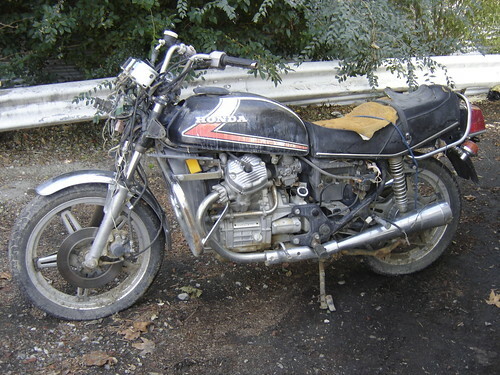 Home Come Back Any Time 2008 November What would I want with a junked out 1978 Honda CX500? 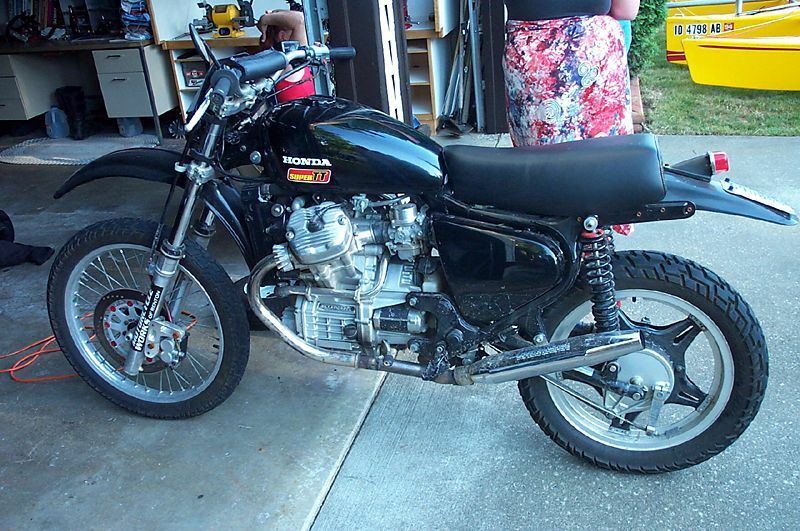 What would I want with a junked out 1978 Honda CX500? 1978 Honda CX500 Gauges and Tank, originally uploaded by evanfell. I came to Los Angeles and within 3 hours of arriving I was already picking up a bike. For some reason the CX500 and CX650 motorcycles have slipped my grasp over the past few years. I was supposed to pick one up about a year ago, but that deal got squashed somehow. So when I saw this “beauty” up for grabs I jumped on it. Obviously it is a dog. A dead dog. The bike is beat to junk and weathered worse than McCain’s face. It is only missing the headlight, blinkers, side covers, and clutch lever, but the seat, gauges, throttle, tires are absolute garbage. – On the plus side the motor turns over fine so I’m sure it will be a runner. The Honda CX500 was introduced in 1978 so this is a first year model. Common problem points were stator failure (particularly on the early models) and cam chain slop. With the cam chain properly adjusted at regular interval these bikes will run 100,000 miles easy without a rebuild while cruising 80 mph all the while. They were marketed as a downsized touring bike, this is true particularly with the CX650 which was available in “Silverwing” trim with full touring fairing and luggage. I haven’t decided to what extent I’ll dig into this bike. 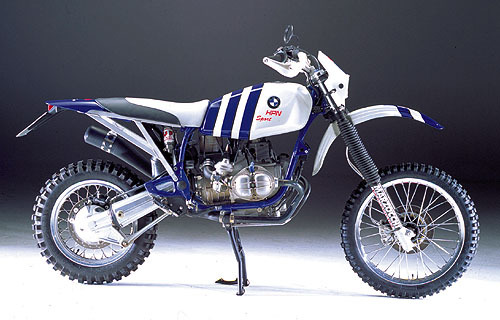 I have a crush on this CX500 dual sport bike which I believe was built by Phil Kopp in Australia. It’s obviously a poor mans HPN rally bike, but sometimes you just have to work with what you have. The disadvantage of a CX500 for this style of bike (compared to the BMW Boxer) is the counter shaft design of the motor. Transversely mounted twins are notorious for having a gyroscopic effect when you hit the throttle. Honda eliminated this by having the output shaft spin the opposite direction as the crank. While this smooths out the motor in a sense, it also makes it slightly more complex, heavier, and more difficult to modify for performance. But I digress. ..
I’ll post my progress as it comes. sounds like a righteous project! Keep up the good work! That’s going to be a tough project but I hope it goes well. Wow, I just bought an old 78 cx500 the exact same color and everything as yours! Mine was kept much better however, lol. Bring her back from the dead man! @Bill – Wow, I’d LOVE to see some photos? Have any floating around somewhere? Sounds like a sweet project. If ya end up needing some pointers on these cx500’s check out choppercharles.com , You will not meet a better bunch of guys on these forums. Does not matter what your question might be, these guys will know the answer. They have been a world of help to me as I’m about to do a stator job on mine. hello everyone, i have what i believe to be an 81 cx500 motor. It is in a custom made bike. A guy lost interest in this 90% completed project. The bike has set for a year so when i go to fire it for the first time im sure a lot of rubber stuff is gonna come apart. can u help point me in the right directions> Also what is this triple bypass that i hear about that will need to be done? @brad What rubbers are you concerned about? The intake manifolds can be sourced from a variety of online vendors. There isn’t a whole lot of other rubber parts on the motor, except for caps and covers. The bypass is probably related to a new stator – but you won’t know if you need one until the bike is running. Why not just fire it up? I’d love to see a picture of the custom bike. I have a 78 cx500,love it.I am in the middle of redoing some things on it,when i am done ill post some pics for all.This bkie was bought in worse condintion then the one above.I have 1972 triumph straight bars,custom bobber seat,lowered and i am going to shave rear end to put 200 tire back there.I came here for help w/ wiring,and i got it.Just like in your posting,yes the stater has to be changed.i have all my parts now its time to get busy. I bought a 78 cx500 about a year ago and have slowly been rebuilding it. I thought I had everything done that needed to be done, but it still does not run smooth and hesitates alot while trying to accelerate. Sometimes it doesn’t want to rev up to a point to where I can even get into second gear. Any suggestions? I am being given a 1978 cx500 thats been bounced around several garages in the family since 94. Prior to 94, it ran well, and was used as a back and forth commuter bike, roughly 30 miles a day. It’s been in the garage since 94, with a cooling system leak. My mother has decided to let me have the bike, making plans to get it this weekend, maybe earlier, and start looking it over for restoration/rebuild. Anything in particular I should be checking first, mind you I work on cars plenty, motorcycles, never worked on a single one, and have never rode a motorcycle in my life, this hopefully will be my first bike…oh geez, this should be fun. When I get the bike, I will post some pics. Give me a shout, with a few pics and details.. mileage etc.. I will set you on the right path..
Bikes are die hard but have to be maintained..